Get a new FREE Spinbrush! 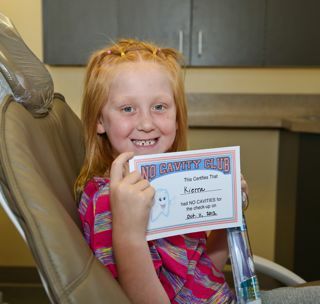 And get a No Cavity Club Certificate to take home to frame and be proud about! As parents, we want you to understand why it's important for your child to brush his or her teeth at a young age. Even though they are only baby teeth and will eventually fall out, believe it or not, baby teeth play hugely important roles in your child's mouth! Check out this article on our blog about Oral Care for Your Child. When you come in for your next cleaning, feel free to ask questions about fluoride, sealants, and other appliances that may benefit your child. We welcome your inquiries and want you to feel comfortable enough to trust our input in the health of your child's teeth.